The Dota 2 International 5 came to a close this weekend in possibly some of the finest showcases of Dota 2 we’ve seen at an International. 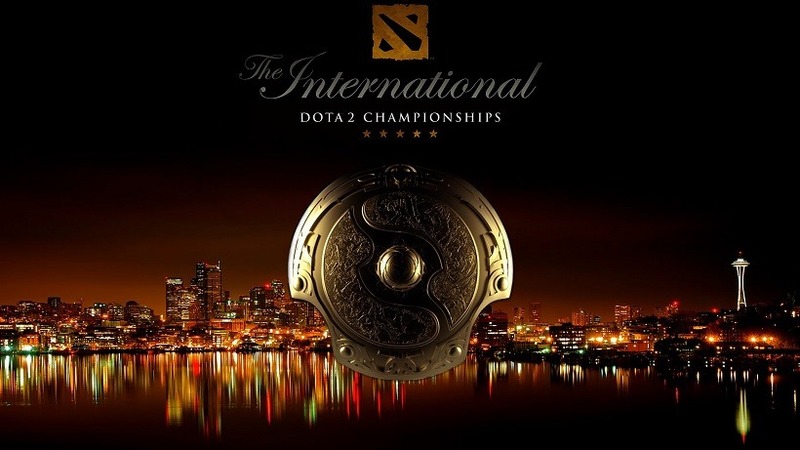 On Saturday evening we had just three teams left in the The International: Evil Geniuses, LGD Gaming and CDEC Gaming. Nobody wanted a repeat of last year’s International, East vs. East, so rooting for Evil Genius in the Loser Bracket Final was the only way. As mentioned above, the last thing I wanted to an East vs. East Grand Final. You could say I was some what terrified by what happened last year, the final being incredibly boring. With this in mind, I joined in the chants “USA! USA! USA!” and backed EG all the way. The draft allowed both teams to grab up some of their signature heroes. We had SumaiL on his Lina, Aui_2000 on the Enigma, xiao8 on Clockwerk and of course the Sylar Gyrocopter. Noting their dominance from the middle position, LGD immediately applied pressure to SumaiL in an attempt to shut him down early. Unfortunately this was not as easy as it seemed as he continued to stay ahead, and prove just how good he really is. Game one was extremely close, some fights came down the to the hair with a few clutch plays from the supports. Captain of EG, ppd, dropped nail-biting Shallow Graves on numerous occasions to keep SumaiL and Fear alive. The most important pick for LGD was their Silence, played by MMY, and it was the stressed importance of the Silence ultimate which should have granted LGD safe passage to victory. Unfortunately from an early stage in the game EG already had the items to negate a successful Global Silence. SumaiL had his early Eul’s Scepter, Fear had his Diffusal Blade, and UNiVeRsE (if timed well) could snowball through it. This unfortunately lead to a few thwarted team fights for LGD, and even though MMY was able to pick up a Refresher Orb, the Global Silence unfortunately did not have the same effect. After an extremely close game, Evil Geniuses were able to clinch the win, and again SumaiL on his Lina proved to be too strong for LGD Gaming. Following suit, game two was just as close with our favourite players grabbing up their favourite heroes once again. Leshrac, I’m 100% on the statistics, has been one of the most banned heroes at TI5. The drafting process versus EG is always an interesting one. There were comments that Fear has a limited hero pool, but at the same time there was one hero that teams would ban against EG, which they wouldn’t normally ban against other teams – The Goblin Techies. I think the fact that EG have showed promise with this menace in the past is a major advantage for them, not because they can play it well, but because it takes up an important banned slot for their opponents. Once again we were treated to an extremely close game with trades all over. Again SumaiL was the hot topic for LGD as the tried to thwart his efforts in mid. Facing off against Maybe’s Shadowfiend was no easy feat, but SumaiL managed to keep up on his Leshrac ahead of all LGDs efforts. Fear, on Clinkz, went for early rotations, returning fire on Maybe in the solo mid and catching out MMY! on rotations. LGD took an early lead with Sylar’s Gyrocopter grabbing up a few kills to get things going. Sylar grabbed a few multi-kills, but as soon as Fear began roaming and picking up the odd kill the composition and initiating power of EG proved too much. If there’s one Clockwerk player who might just be a bit better than xiao8, it’s UNiVeRSe. When I mention initiating power it was basically the UNiVeRSe show and after an extremely tight game two Evil Genius managed to secure the win and knock LGD out 2-0. CDEC were the Cinderella Story of TI5. They came from the Wildcard Playins, absolutely destroyed in the Group Stages and had an undefeated run to the Grand Finals. This is where a lot fans of Dota 2 were split. Do we back the team who have impressed us all? Or do we back EG, where Old Man Fear deserves the win? It was really was a conflict of emotions, but nonetheless we were about to be treated to some of the best Dota 2 we’ve seen in ages. The Grand Final kicked off and once again we were treated to an interesting ban/pick phase. UNiVeRSe was allowed his Clockwerk, SumaiL his Storm Spirit and of course Fear on his Gyrocopter. On the other side of the river CDEC snagged up the ever so popular Leshrac on Garder, Winter Wyvern on Q and Shiki playing the Queen of Pain. From the early stages CDEC’s strategy became clear. They were going to completely shut down SumaiL in the middle, and hit EG where it hurts. When SumaiL could no longer take the torment of gangs in the solo mid, he opted to move into the jungle to handle some stacked neutral camps, which ppd had been stacking up for him. This allowed SumaiL to grab an 18 minute Orchid Malevolence despite being down 0-3. It was then when it became clear that shutting down SumaiL was unfortunately not the answer to defeating EG. Evil Geniuses pulled ahead early on, and ran away with the game. It was then we thought we might have 3 quick games as the first one ended 27-8 to Evil Geniuses. CDEC picked up Leshrac once again in the draft phase, with EG almost mirroring their picks from game one. Why fix what’s not broken? The only difference is that the Wind Ranger was picked for SumaiL, and the crowd’s roars seemed to agree with the choice. There was one pick which completely threw EG off – The Broodmother on Xz. What threw them off even more was the laning choices of CDEC. They sent the Broodmother into the solo middle to take on SumaiL, while sending an “Agressif” lane top with Queen of Pain and Tuskar. Early on EG realized they could not handle the top lane, while middle was under assault as well, and the rotations were a clear indication that EG might be in a spot of trouble in game two. Top lane was lost early on, UNiVeRSe got little to nothing bottom lane, and middle was unfortunately not going as great as usual. CDEC applied the pressure with split push power coming from the Broodmother, while their composition of four-man assaults still proved deadly. The burst from Leshrac and Queen of Pain proved too strong and EG lost game two 29-17. Leshrac featured once again for CDEC while EG went for the Gyro and Clockwerk. EG changed things up and went for the Undying on ppd and Ember Spirit for SumaiL. We also saw our first taste of Slark and Lion, an interesting choice for CDEC. Honestly, sounding like a broken record, this was once again the SumaiL show as his Ember Spirit was played to perfection. It seemed every spell in CDECs arsenal was no match for the Slight of Fists on SumaiL’s Ember Spirit. He managed to dodge almost perfectly and once again EG pull ahead with an early lead and took game three. At this point we could feel it. EG were one game away from taking the championship, and after two one sided maps in their favour it was time to seal it off. Again Fear played Gyrocopter, SumaiL played Storm Spirit and the Naga Siren finally made an appearance on Aui_2000. Garder managed to grab up the Lina, with Agressif getting his hands on Phantom Lancer. Evil Geniuses took an early lead against CDEC with glimpses of hope from Agressif on his Phantom Lancer. You could see the pressure was on both teams as we saw the First Blood arrive at the latest it has this tournament. SumaiL dominated in the Solo mid against the Dragon Knight, but the game was relatively quiet. Agressif decided to Boots of Travel into Diffusal Blade, his favourite choice, and already we could see the direction in which CDEC were going. When the Dragon Knight picked up a Blink Dagger, it became clear that CDEC saw SumaiL as a major issue. After a few team fights were EG and CDEC traded evenly, EG continued to pull ahead and this force CDEC to do something risky, go for a Roshan kill. Once they picked off Storm Spirit in the middle they decided if they had any chance of getting back into the game they had to take Roshan, right now. The were down on gold and experience, but the Aegis of the Immortal would have secured at least two tier two towers and the beginning stages of a Heart for Phantom Lancer. Being one man down EG couldn’t really contest the Roshan, or so we thought, but they attempted to at least delay it with Ancient Apparition and Earthshaker. EG knew they were in Roshan, but CDEC might a fatal mistake stacking together, and we got to see one of the best plays in TI history. Fittingly,that was the biggest dunk at the Key Arena, to date. EG managed to secure Aegis of The Immortal and apply the final pressure needed to secure the grand final. CDEC did not give up and fought with everything they had right up until the last second, but it was not enough and EG won The International 5 with a score of 3-1. 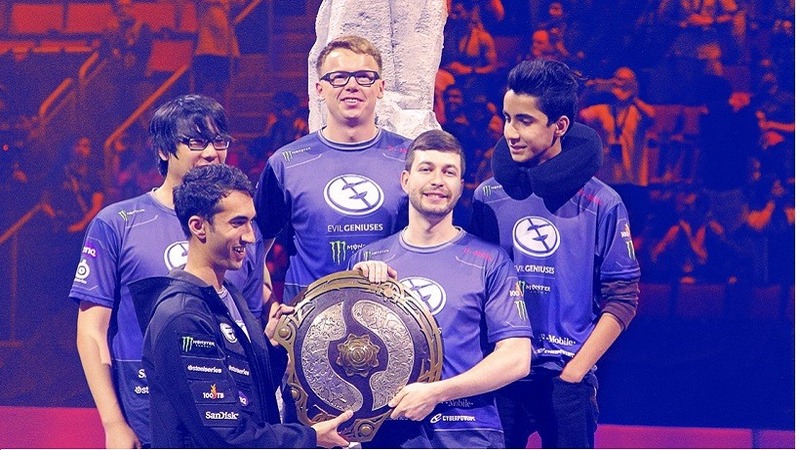 Evil Geniuses, the first American team to win The International, raised the Aegis of the Immortal as your 2015 Champions. $6.6 million placed the five players at the top of the eSports earning’s list and gave them all millionaire status. The only thing I could think about after watching the final was this moment during Valve’s Free To Play documentary. Previous article Can you feel it? First international TV spot for STAR WARS: THE FORCE AWAKENS!